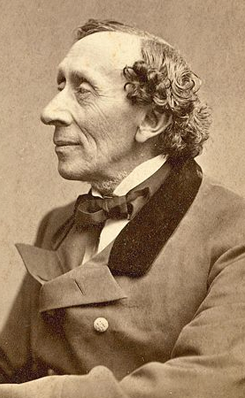 “Hans Christian Andersen’s House was acquired by Odense Municipality and restored from 1905-1908. The purchase was made in celebration of his 100 year birthday on the 2nd of April 1905. During the restoration, it was crucial to restore the original appearance of the exterior and make the interiors suitable for a museum. The museum opened in 1908 and in 1928 Odense bought the small houses surrounding Andersen’s home, to expand the museum. On the 4th of June 1931 Odense celebrated the opening of the new museum. The museum had been expanded with a spacious dome, today known as The Memorial Hall. In this hall eras of Andersen’s life are depicted with inspiration from his book The Fairy Tale of My Life. The house had under the restoration been brought back to its original, but the space was tight. By the measuring in 1908 the house was 44 square meters, divided on a living room, kitchen and a small aisle. In celebration of the 100th anniversary of his death in 1975, the museum was expanded with new buildings alongside the Memorial Hall. In 2002 the museum was refurbished and rebuilt. Much of the restoration was done with the intent of refreshing the visiting experience.